Time magazine noted that Seaside "could be the most astonishing design achievement of its era…." Visions of Seaside is the most comprehensive book on the history and development of the nation’s first and most influential New Urbanist town. 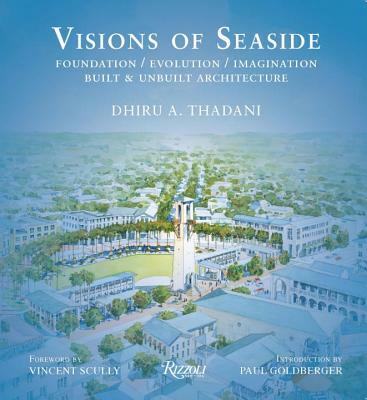 The book chronicles the thirty-year history of the evolution and development of Seaside, Florida, its global influence on town planning, and the resurgence of place-making in the built environment. Through a rich repository of historical materials and writings, the book chronicles numerous architectural and planning schemes, and outlines a blueprint for moving forward over the next twenty-five to fifty years. Among the many contributors are Deborah Berke, Andrés Duany, Steven Holl, Léon Krier, Elizabeth Plater-Zyberk, Aldo Rossi, and Robert A. M. Stern. Dhiru A. Thadani is an architect and urbanist who has worked on projects in Asia, Europe, and North and Central America and now serves as urban design consultant to several U.S. and international cities. He is the author of several books. Vincent Scully is Yale University’s Sterling Professor Emeritus of the History of Art and Architecture, author of numerous books, and recipient of the National Medal of Arts, the nation’s highest honor for artists and art patrons. Paul Goldberger is a Pulitzer Prize–winning architecture critic and a contributing editor at Vanity Fair. He is the author of more than ten books and coauthor of many others.